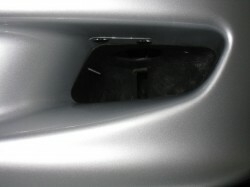 The previous owner of my M Coupe had installed most of the Dinan bells and whistles, most of which I have removed. 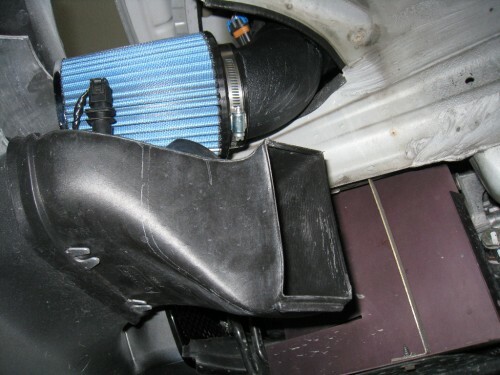 One I kept was the cold air intake (CAI) as it is one of the few out there for the S54 in the Z3 chassis and has positive reviews. 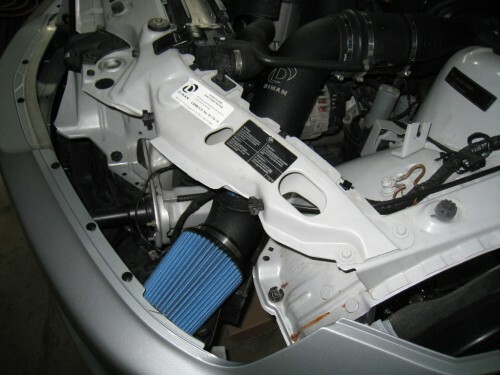 While I had the front bumper off, I took the opportunity to remove the filter (it’s buried deep inside the driver’s side corner of the bumper.) Good thing I did, as all the filter oil had long since dried up and the filter wasn’t in great shape. There’s simply not enough room for it, the result was several dents in the wire mesh. So I started looking for a slightly smaller replacement. 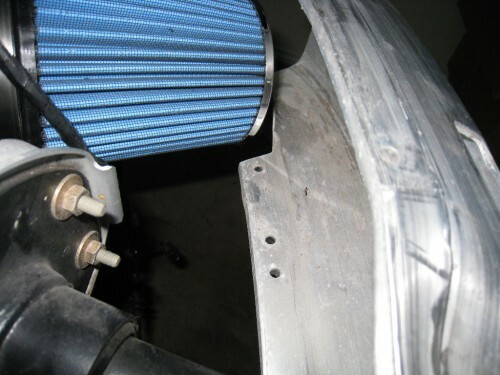 The Dinan filter is a wire mesh and cotton gauze type filter, virtually identical to the K&N filter. I came up empty looking at K&N, AEM, and AFE. 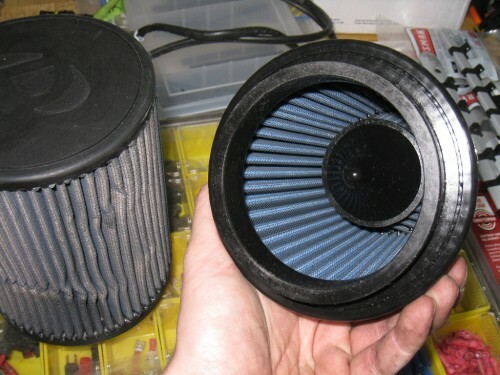 But Amsoil had a filter that looked like it would fit the bill, model EAAU3555-EA. Their filters use a “dry” element with no oil, but are reusable and can be washed. Though this filter was slightly smaller than the Dinan, it did have an inverted cone filter top, so chances are it’ll flow just as well if not better. Inside of filter, showing inverted cone. With the new filter installed, I saw there was a bit of interference with the aluminum crash bar. 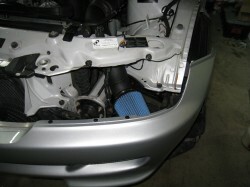 The Dinan filter probably hit here as well, but it has a rubber top unlike the Amsoil’s metal. Since I didn’t want to worry with the two metal pieces rattling, I did some clearancing on the crash bar. 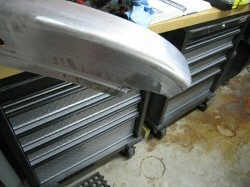 Bumper after removing a small amount of material. 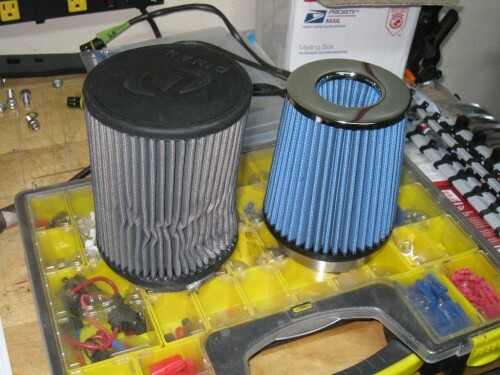 As seen in my previous posting, I had changed out the Dinan air filter for a slightly smaller one from Amsoil. So now on to the install. Pretty straight forward, remember I did have to clearance a bit from the aluminum crash bar. I made a few other modifications to help it fit even better. 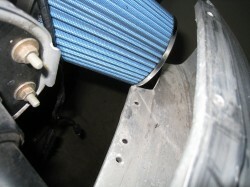 The air filter element rest directly over the left brake duct, which has a molded in intake on top. This intake hole has a slightly raised lip, which was pushing into the bottom of the filter. A razor blade made quick work of that, gaining about 1/4″ more space. 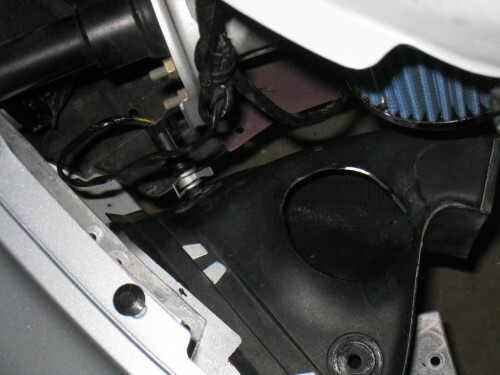 The outside air temperature (OAT) sender is also located on top of the duct (see the small hole the lower part of the photo below.) The sender, it’s plug, and wire were also interfering with the filter. So I drilled a hole in the side of the duct and relocated the sensor mount to the side of the duct with some 3M plastic epoxy. The hose clamp in the photo is not original, but I added it as the sensor was a bit loose in its mount.